The concept of governance is all-encompassing and multi-dimensional. It refers to a number of processes that are exercised by both public and private entities. In the private sector, business structures create networks, alliances, and collaborations to strengthen their investments and gain more profitable results. To protect the interests of participating parties, a governance agreement is created in order to establish a governance structure so that proprietary rights are respected and disputes are settled efficiently. Like any other agreement templates, these types of arrangements are vested with complexity because various factors must be considered. 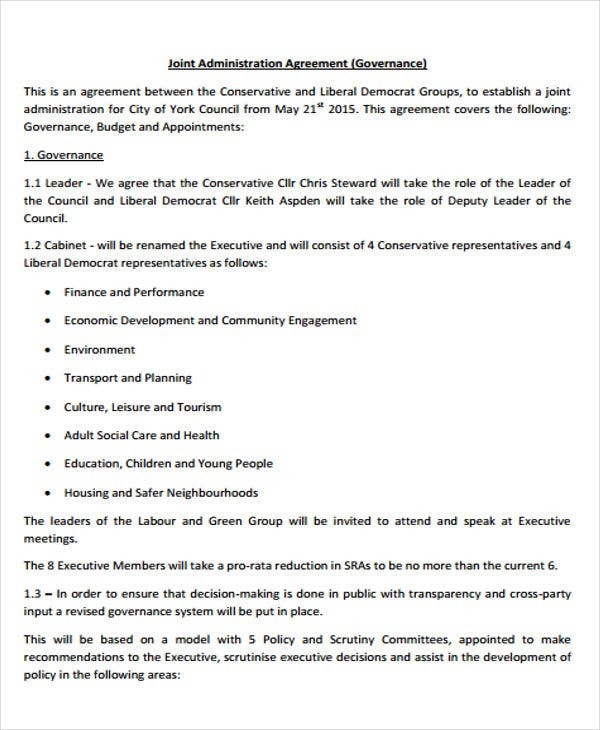 To help you out, there are governance agreement templates that are downloadable on this post. Most governance agreements are brought about by collaborative contractual arrangements and synergistic understandings. 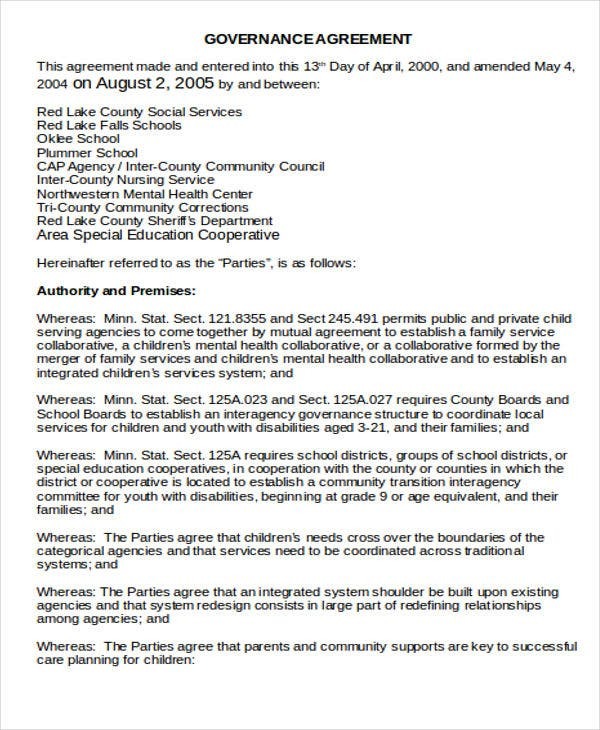 Here are some types of governance agreement templates that you may download and use. Corporate Governance Agreement Templates – The laws and policies that govern the conduct of corporate bodies vary from country to country. You need to consider the prevailing guidelines that your corporate laws provide. 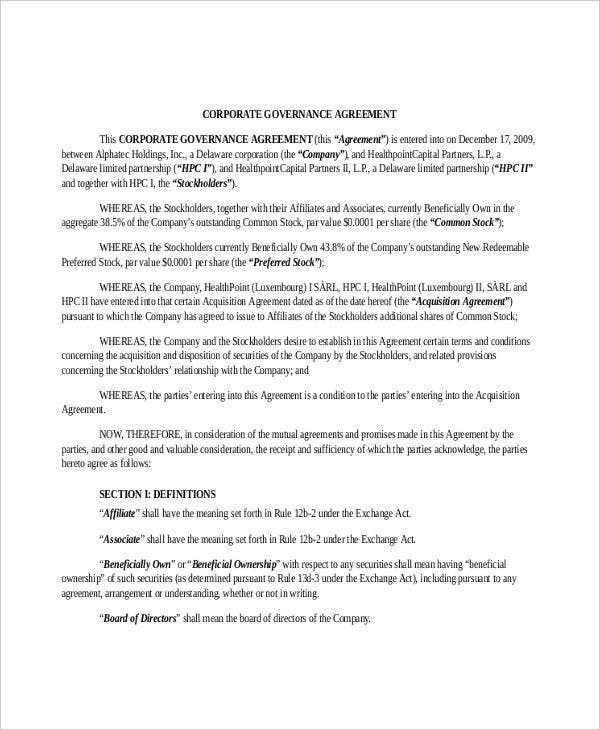 For corporations, these agreements contain the terms and conditions that govern the management of the overall transactions of a corporation such as how directors are elected and the required qualifications. 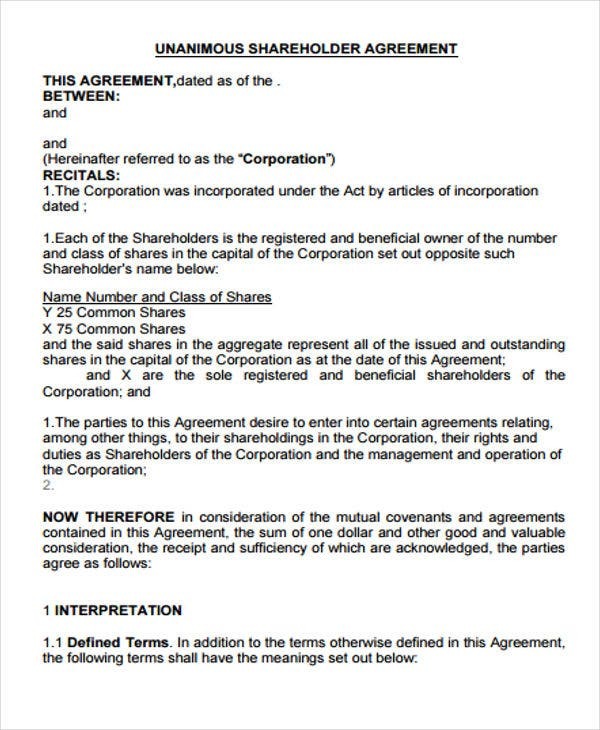 Furthermore, the corporations can use shareholder agreement templates in drafting their agreements. 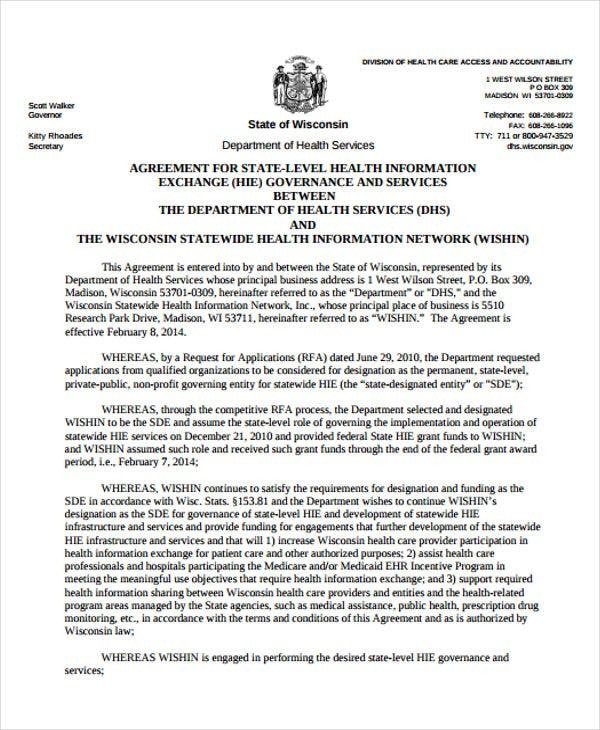 Agreement for Health Information Exchange Governance and Services Templates – There are also instances that governance agreements are executed between a public entity and a private organization to uphold the general interests of the public. Joint Governance Agreement Templates – If two or more parties lead a certain organization, it is inevitable that conflicts will arise. 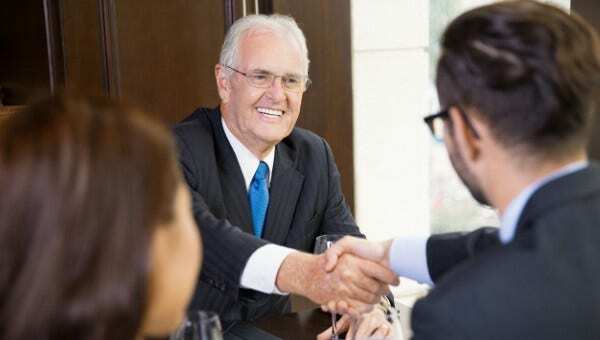 To mitigate the adverse effects of such, joint governance agreements are executed between the leading parties in a government structure or business formation. For limited liability companies, they may also use printable sample operating agreements to govern the management of their transactions. How to Enhance the Format and Content of Your Agreement? Drafting an agreement is not a favorite endeavor by most of us. It is mostly done by legal professionals who have the legal background and authority to do such. However, it is still highly suggested that you learn the basics of writing and enhancing the format and content of an agreement. Here are some basic techniques that you may refer to. Come up with a comprehensive outline. An excellent agreement does not come out from a vacuum. It is a product of a series of consultations, discussions, interpolations, and research. Outlining allows you to sort out and organize your thoughts. Use clear and unambiguous language. One of the major defects of an agreement is the use of general and ambiguous clauses and provisions. Contracts and agreements must connote a single idea so that the parties will focus on one accepted interpretation. Define important terms. In writing an agreement, the contracting parties may adopt modified definitions of certain terms. Defining them can instill consistency. Contract templates will further introduce you to the essential components of a contract and agreement and how to effectively elaborate them.